Here’s a little art history to set the stage before we go any further. I bought “Metamatic” in February of 1981; a little over a year after it had been released. “Metamatic” was just a word to me then, but within a year, I was in art college and came across the word in an art history book and the penny dropped, as it were. “Metamatics” were first the given name of kinetic sculptures made by Swiss artist Jean Tinguley in the 1955-1959 period. Tinguley was influenced by both the industrial era of the time as well as the Dada movement in art. In seeking to demystify and deconstruct the notion of artistic genius, Tinguley built machines that would make drawings that looked for all the world as if they were the product of Abstract Expressionism; which was a movement that had immediately preceded the development of Tinguley’s machines. The mechanisms he constructed would move in a prescribed path, but their construction was not rigid; therefore no two pieces of art made by the machines looked alike due to random variations. He was making machines that made art in a self-generating capacity. Generative art akin to the generative music that has captured Brian Eno’s attentions for so long. 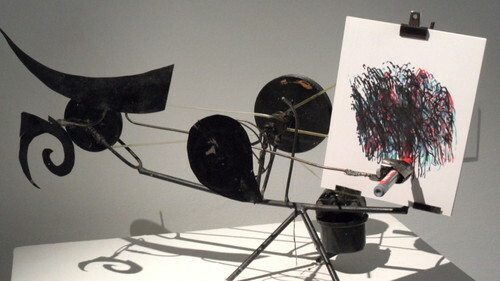 Tinguely’s Metamatics were a cybernetic approach to generating art; machines that made art. Given that background, it’s not surprising that Foxx chose to pick up on that name. After all, he was making a schismatic break from the run-of-the-mill world of rock bands and was attempting to adopt a Bauhaus perspective on how machines were used in the context of popular music. Germany’s Bauhaus movement of the 1920s coined the design philosophy of “form follows function” whereby the synthetic modern emulation of old-fashioned ways of building objects; applying woodgrain images to surfaces which were modern steel, for example – was eschewed as being intellectually fraudulent and decadent to boot. Similarly, Foxx had decided that he would strip away all of the conventions of rock music that had applied to music made prior to 1979 and throw it into the dumper. Synthesizers would not emulate acoustic instruments or pipe organs. 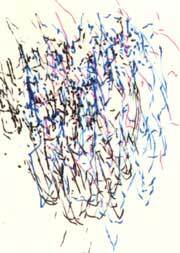 Rhythms would be made by machines which were metronomic in their timing. The American tradition of rhythm and blues; simmered in high-key emotionalism, was avoided. Foxx instead sought to make a music informed by European sensibilities; re-imagined as if America were not the point of origin for modern pop music. The studio would be used to capture the raw essence of these machines and their traits. In the end, Foxx chose Pathway Studios, a modest 8-track facility in Islington where seminal music by Lene Lovich, Elvis Costello, and The Damned had been recorded. One would imagine that Stiff Records leaned heavily on the facility. Foxx wanted to avoid the baroque 48 track approach of rock excess and its commensurate artificiality. Perversely, he sought to highlight the traits of machines by stripping away production artifice and bringing their qualities into sharp relief in ways that had not yet been done in rock. While still on Island Records, Foxx had gotten a glimpse of famed dub reggae producer Lee “Scratch” Perry at work in the studio and the amount of space and separation in the dub mixes he achieved stuck with Foxx. When the time came to set out on his own, he would revisit the sensibilities at work there and point them in the very different direction that he wanted to head off in. Next: …But What About The Music? This entry was posted in Core Collection, Record Review and tagged 1955, 1980, Jean Tinguely, John Foxx, Metamatic, Metamatic Records. Bookmark the permalink. That Tinguely penny didn’t drop for me for a decade after I first hear Foxx solo. 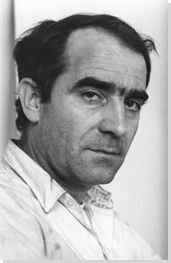 Correlating Foxx’s music with the work of Tinguely opens the listener to another layer, another level of what Foxx was achieving. Bringing in Abstract Expressionism is also a wonderful comparative. I am a great fan of A/E and while much of the work can be seen as expansive and IS interpretive, I have always found it to be the art of the insular, the art of introversion. It is insularity and introversion that strike a chord in Foxx’s work over the decades.